Good evening and welcome to the opening ceremony of the Hong Kong SAR Pavilion. It is an honour to be here with you at the Posidonia 2018, a flagship event of the maritime industry. This year, it is the 3rd time for Hong Kong to participate in this important biennial event since 2014. 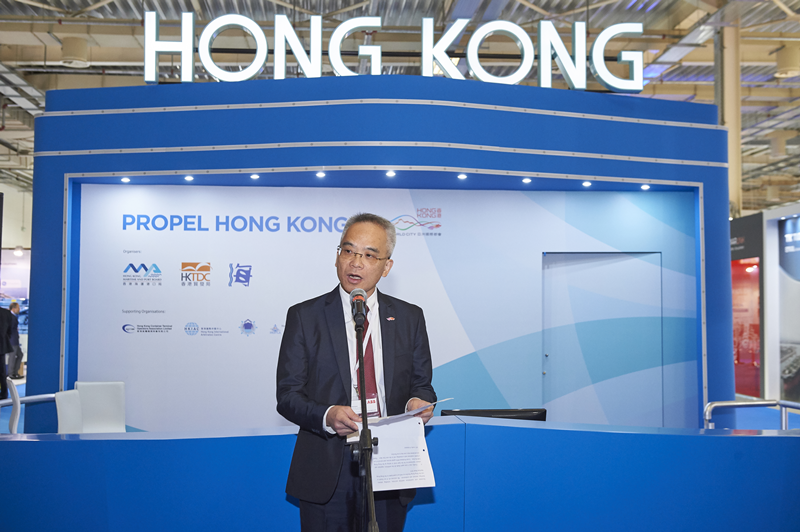 The Hong Kong Pavilion is jointly set up by the Hong Kong Maritime and Port Board, Marine Department of the Hong Kong SAR Government and the Hong Kong Trade Development Council. May I take this opportunity to thank all of our co-organisers as well as our fellow exhibitors for their support provided for this exhibition. Hong Kong is a global city and an international maritime centre. Similar to Greece, our coastal line generates numerous opportunities and possibilities for centuries, and now we carry on our journey, hand-in-hand with cities of the Mainland China, into the new era led by the nations’ Belt and Road Initiative. One of the key elements of the Belt and Road Initiative is to “connect” – i.e. connecting China with all parts in the world. Connectivity is Hong Kong’s core strength. Strategically located at the heart of Asia, Hong Kong maintains sea-cargo operations with 48 countries along the Belt and Road corridors. With frequent schedules of liner services and connectivity to some 470 destinations, the Hong Kong Port is a major transhipment hub in the region. At present, the Hong Kong Port is one of the busiest ports in the world handled nearly 21 million TEUs in 2017. To this end, we stand to serve as a “super-connector” facilitating trade and capital flows amongst China and the rest of the world. Moreover, Hong Kong is a centre for maritime activities. We provide value added maritime services to worldwide customers and there are unique advantages doing shipping business in Hong Kong. For instance, we exempt profits tax for international shipping business, including international carriage of goods and charter hire income from ocean-going vessels. In addition, under the Closer Economic Partnership Arrangement between China and Hong Kong, Hong Kong maritime services providers enjoy national treatment when they access the Mainland market. All of these have made Hong Kong a home base for over 800 maritime services-related companies. These companies support the international shipowners by providing a myriad of quality maritime services, ranging from ship agency, ship management, ship finance to marine insurance, legal and arbitration services, and many others. Undoubtedly, doing shipping business in Hong Kong is easy, due largely to our favourable business environment, the open and transparent regulatory regimes, and our strong maritime cluster. Our friends in Greece, if you aspire to extend your business operations to China and the Asia-Pacific region, Hong Kong is your trusted partner. To strengthen the institutional set-up of our maritime industry, the Hong Kong Maritime and Port Board (HKMPB) was established in 2016 with an aim to work with the industry to foster the long term development of Hong Kong’s maritime and port industry. Today, the HKMPB has set up the Hong Kong Pavilion to provide you an excellent platform to better understand the services our exhibitors offer and the latest development of Hong Kong’s maritime and port industry. 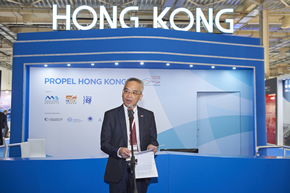 Not long from now, the HKMPB will be organising the 3rd Hong Kong Maritime Week in November with multifarious maritime activities, including industry briefings, seminars and conferences. We welcome all of our friends to visit the Hong Kong Pavilion as well as to participate in the Hong Kong Maritime Week 2018. Finally, may I once again thank all the exhibitors, organisers and industry representatives for the hard work in setting up the Hong Kong SAR Pavilion. I wish Posidonia 2018 a great success, and wish all of you a fruitful experience and a rewarding visit in the next four days. Thank you and please enjoy your stay in our Pavilion.